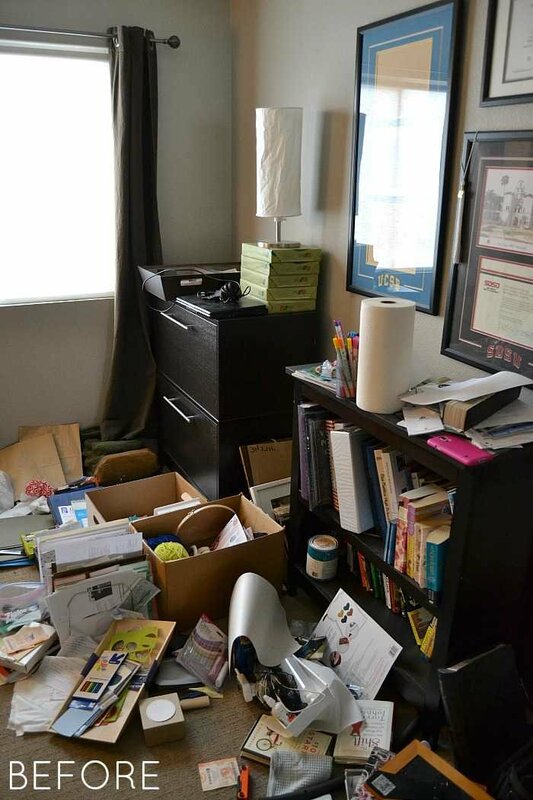 The room that all those little piles of crap laying around get shoved into 20 minutes before company arrives? Or the the room that stores the stuff you own that doesn’t have a home? The stuff you don’t even know you own or why you own it? Ok. Good. I’m not alone then. So it’s safe to invite you into this terrifying mess that I’ve been using as my office. Talk about a blow to the ol’ creativity. You ready? I’m going to cover my eyes so I can’t see your reaction. Please don’t judge cause I have a plan and it is going to be awesome when I’m done. Oh man. How have I managed to muster any ounce of creative juice while sitting in this room? I am mortified but I wouldn’t be doing my job if I wasn’t willing to put it all out there. The whole point of this blog thing is to inspire you to create a home you love. And well, sometimes that means a really good non example. I mean c’mon. It shouldn’t take 20 minutes to find a pair of scissors right? And I’m sorry, but how many such-and-such for dummies books does one family need? I am sooooo ready for a more productive use of my time and this space! At some point I did attempt to organize my supplies in the closet. But let’s just deem it a fail so I can move on and away from these photos and redeem myself with the plan that I have for this space shall we? Clearly this room is in need of a few (or few dozen) things. Here’s a short list of the immediate needs. A filing system that we can keep up with. A system for bringing in the mail and getting it sorted right away. An overall inspiring space that makes me feel organized and creative. Here’s what I have come up with so far. I’m thinking lots and lots of white! Each of us will have a side of the room. Mine will have my desk, craft storage, and a work table. 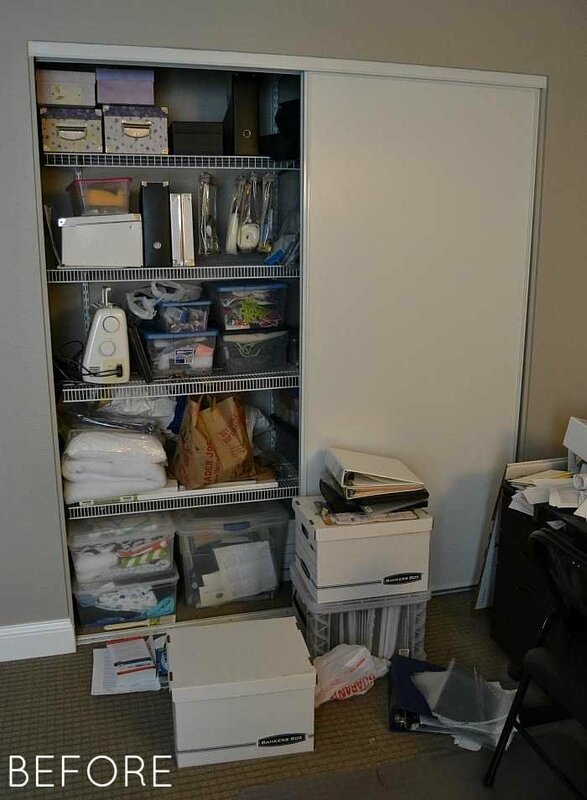 His side will have his desk and the filing system. I’m excited to also have wall space on each side of the room that we can make our own with things that inspire us to do great work and a showcase of accomplishments. This has been long overdue and getting this room in order is going to make such a huge difference in my business, our life, and let’s be real…my marriage! Do you have a room in your home that needs a total clean out and overhaul? Do tell to ease my embarrassment pretty please! Hey There Home Headquarters is happening people. And it’s going to be good! You’re so welcome, Teresa. I can’t pretend to know your unique situation but I’m glad you found my ideas helpful. Best wishes! Thank you so much for these photos. We are not alone! It’s not just one room with us, though. Piles have minds of their own! Hey Vicki. I like to keep it real. Getting this space under control has been life changing, but yes piles do have a mind of their own. They just like to appear out of nowhere!!! I’m so glad I’m not the only one with a room, or 2!, in a mess. I’m currently trying to make a craft corner in our spare bedroom & your post has given me hope that I can achieve it! Thanks for the inspiration & allowing your readers to see your home. Hi! I love your plan! Do you know by any chance the pantone names (numbers) of the colors you are using here. Especially the pink or rather it seems to be a pinky coral? thank you! made me feel a little better. unfortunately my entire house resembles this 🙁 can”t wait to see it when you are done! I emailed you a few months ago when I started using your method for a redo. My mess was the small living room in our mobile home. I tore everything out, gave away most of the furniture that was crowded wall-to-wall and started over. At that point my spouse had a stroke and everything was put on hold. That was Christmas Day. He improves daily and is a big help with this project. I bought the paint sprayer that you suggested (and I love it). I painted walls, furniture and a pole lamp. We bought new window blinds and had the carpet removed and new laminate flooring installed. We just received the 10′ slab of Formica that I will use for a desk and a work surface for my two sewing machines. We are almost finished and I will post the before (ugh!) and after (yea!) pictures soon. Thank you for all of your decorating suggestions and the step-by step process. Hi Barb! I’m so happy to hear that your husband is doing better and that you have made so much progress (and that you are getting a special place to sew!) I seriously can’t wait to see your before and after! Keep up the great work. It’s going to be so good when it’s done! I’ve been working on my craft room lately too. It’s so nice to have a space that actually works! I’m so glad to know I’m not the only one! I can’t wait to see how you make your room functional. Thanks Laurie. I was so nervous to post these horrible photos of my crazy office, but I’m so glad I did because the comments so far have been that almost everyone has this problem. All the more reason to make it awesome and share the tips! lol! First off our “hotmess” room is our den. For the extact same reason, the crap collecting room! I’m so glad I’m not the only one that has a “junk drawer” room. I can’t wait to see your idea board come to life. We made a dent by getting rid of our huge pile collecting desk (donation) and selling the huge chair that went with it. Keep up the fabulous work! 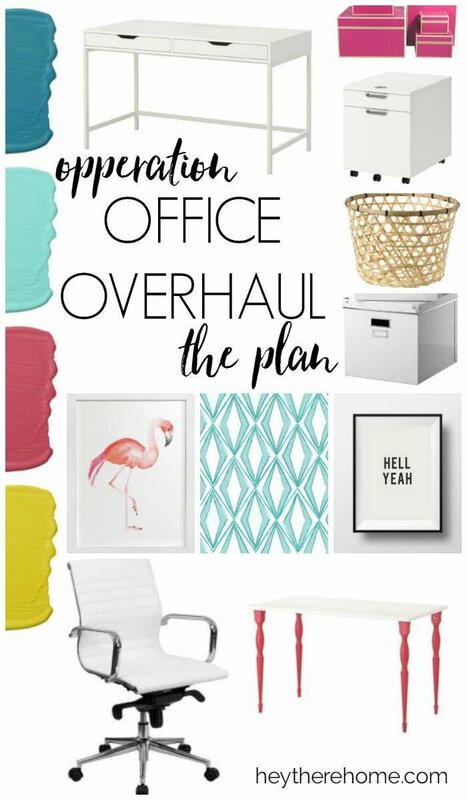 Your inspiring me to create a co-space for our new family business “remodeling (him) decorating (me). Thanks Pilar and way to go with getting rid of what wasn’t working! I’ve been busy overhauling this space and I can’t wait to show you all the transformation! I can’t wait to see what you do maybe it will give me some inspiration to do mine!!! Our office is an office nook in the mud room, right across on opposite wall is the seeing nook ( thankfully hidden with bi-fold doors ( when I can get them to shut!) Even when I clean and organize the office area it’s still ugly! Same goes for sewing area. I hate mail, and I hate little pieces of leftover fabric from previous projects. my areas would resemble yours if not for the fact I have to travel that path to the laundry room. My office is a wreck too! Between junk mail, hate it! And my bows and bandanas mess, I’m happy to shut the door and not let the chaos out to nag at me every time I walk by that room. Inspire me to make it functional, please! Can’t wait to see your transformation! 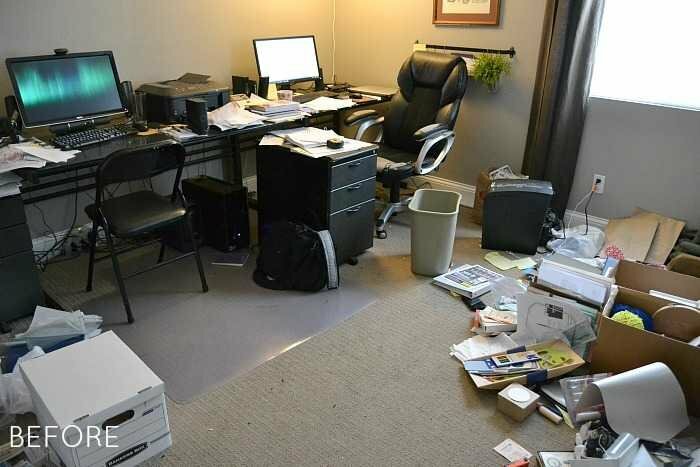 I am ashamed to say it but I too have a messy office which I find it hard to work in. We do have a his and her office which works quite well. I am in the middle of getting some order back into it. The thing I find hard is that it is long and thin. Wanting to get rid of the gym equipment but not sure where else I have the room to put it. Would love to hear of any suggestions you may have! Nope, I don’t have one embarrassing room in my home(snubbing nose); I have a home full of embarrassing rooms. BWAHAHAHAAHA! I am so embarrassed to admit I have a room that is worse. I moved to a senior citizens complex that is smaller than my former home. I have my bedroom and a large walk-in closet filled to the top. What is worse it is just STUFF but I just can’t give it up yet. It is my stuff. However the most embarrassing thing I must admit is “I moved to my present home almost NINE years ago. Now don’t you feel better? Now, I am going to lay down with a cold cloth on my head and think about something more pleasant. Sheesh, I wish my messy studio was as “messy” as yours!!! I can hardly waid thru mine. Maybe I’ll get inspired with you!! I started laughing when I saw your room, and immediately felt better about myself! You are a brave woman for admitting this. I’m looking forward to seeing how you make the changes and I will sincerely try to follow with my own office! How about my whole house? I need someone to do the work for me because I have fibromyalgia, but I don’t have anyone to do it. I will say that last May I rearranged my front room, can’t call it a “living” room because as a couple of single old ladies, we don’t really entertain and we spend most of our time on our separate computers. But the rearrangement has kept it from becoming quite the landfill other arrangements had allowed. I try to keep my craft room tidy but it’s usually an epic fail! I seem to use it as a dumping ground for a month or two until I want to start a new project. Excited to see your transformation. I don’t think it looks that bad! But I really appreciate you for sharing as my room is the same right now. We had company and I am continually moving things out of the spare room and in to our room when company comes. And I can’t move it back yet as we are having more company soon. I look forward to seeing your changes! Yes, I do. It is extra bedroom / office. Boxes everywhere. I have some ideas but can’t get going on getting it started. Hopefully, you will inspire me!! My website is in the making and people such as yourselves gives someone like me a lot of inspiration. So, thank you very much!! It’s funny how mom’s office space or closet always becomes the catch all for all the odds and ends. Sadly, my office is also kind of the crap room. I’m with you though: it’s on the decluttering chopping block. It’s messy days are numbered! Can’t wait to see it play out!